2019 Promotion – Free Server and Network Monitoring!!! ATG is now managing 1000’s of Workstations and over 100 Servers! See why so many small businesses switched to us in 2018, saving themselves $1000’s of dollars! Already have Managed Services, why are you paying so much? Antheon Technology Group (ATG) offers three managed IT plans. Our Managed IT plans all include 24 x 7 monitoring, antivirus and antimalware protection, remote control agent, security and update patch management, alerting, asset management and reporting. Our standard “ATG Managed Care” plan adds unlimited telephone and remote control support along with guaranteed response times. Our “ATG Total Care” all inclusive plan adds unlimited on-site support. The Total Care plan allows you to budget and know exactly what your IT support costs will be. Our “ATG Monitoring Only” plan includes all the benefits of Managed Services with no included labor. Put in simple terms – one of the biggest benefits of Managed Services is discovering and fixing problems before they can negatively affect your business. Instead of being reactive, ATG can now be proactive. A managed environment also reduces costs. Businesses are also able to budget and control their overall operating costs with the flat-fee billing model. 2 Patch management reduces exposure to malware, viruses and phishing attacks. Most of today’s malware works by exploiting holes in unpatched software, with up to date patch management these risks are reduced significantly. 3 Remote access of each device allows our techs to engage and fix users issues usually within minutes. Users can request support via a help icon on their computer. ATG offers several additional services including Microsoft Office 365 and Azure Cloud Plans, Next Generation Business Continuity and Disaster Recovery, Cloud Backup and more. These are highly specialized and tailored to each site, so please ask for more detailed information on these services. We also offer 20% Discount for an Annual Commitment for any purchase of ATG Managed or Total Care Plans for 5 or more users.. If you cancel your subscription before the annual contract is over, you’re still responsible for the full value of the annual commitment. We will charge you an amount equal to the remaining balance on your account. * 2019 Promotion valid for new clients only purchasing ATG Managed Care or ATG Total Care Plans with a 3 user minimum. 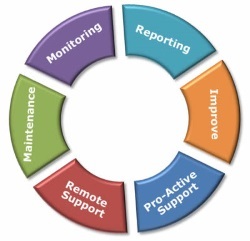 ATG Managed Care includes unlimited remote support and discounted on-site support. Total Care includes unlimited remote support and on-site support. Our goal is straightforward: make the Internet a part of everyday operations by bringing together hardware, software, and cloud services to enable companies of all sizes to move processes online, better understand and respond to their customers, empower their employees with access to critical business information, and connect to suppliers and partners. By doing so, we have helped our clients to achieve greater returns on their technology investments. The difference in our approach lies not only in realizing the unique business problems that our clients face, but also in the understanding of competitive pressures and trends within our clients’ industries. Armed with this awareness, ATG can provide cost-effective, timely, and reliable solutions. Approaching each project with these goals in mind, assures our clients a solution that is tailored their needs, budget and forecasted business plans. ATG partners with today’s leading technology companies such as IBM, HP, Dell, Microsoft, Intel, SonicWALL, Datto and Cisco, and has numerous certifications and designations including Microsoft Silver Cloud Partner. Unlimited on-site support is for the sole purpose of supporting your current infrastructure, devices and users. Locations of On-Site support must be agreed upon before start of contract. It does not include planned projects which would be quoted separately, such as company moves, cloud migrations, etc. All technology related equipment and users must be covered. Cannot pick and choose unless mutually agreed upon. All Plans are billed monthly prior to the month start. These plans are not hardware warranties.